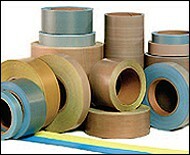 THE PEOPLE AND TAPE PRODUCTS THAT WORK FOR YOUR BUSINESS! 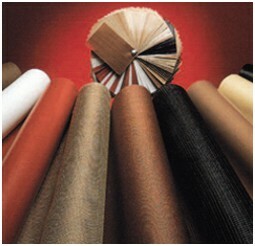 PTFE fiberglass woven fabric substrates possess optimal PTFE content, and leave a minimal fabric impression. Fabrics provide the highest value by offering an excellent balance between heat transfer, release and flexibility. 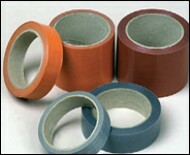 Our PTFE coated tapes are engineered to retain the distinctive properties of PTFE; however, by adding a glass fabric to the matrix; we are able to obtain the added benefits of dimensional stability and durability. Our PTFE films provide a conformable release surface and exhibit a remarkable low coefficient of friction. JM903AS 3 mil, Anti-Static fabric is formulated to dissipate surface static build up during operation 3 N/A Anti-Static Packaging, food products, printing and textiles, polymer processing, aerospace, communications, military, building products, chemical processing, insulation and protection. JM905AS 5 mil, Anti-Static fabric is formulated to dissipate surface static build up during operation 5 N/A Anti-Static Packaging, food products, printing and textiles, polymer processing, aerospace, communications, military, building products, chemical processing, insulation and protection. JM906AS 6 mil, Anti-Static fabric is formulated to dissipate surface static build up during operation 6 N/A Anti-Static Packaging, food products, printing and textiles, polymer processing, aerospace, communications, military, building products, chemical processing, insulation and protection. JM910AS 10 mil, Anti-Static fabric is formulated to dissipate surface static build up during operation 10 N/A Anti-Static Packaging, food products, printing and textiles, polymer processing, aerospace, communications, military, building products, chemical processing, insulation and protection. JM914AS 14 mil, Anti-Static fabric is formulated to dissipate surface static build up during operation 14 N/A Anti-Static Packaging, food products, printing and textiles, polymer processing, aerospace, communications, military, building products, chemical processing, insulation and protection. A division of RC Incorporated. visit our sister companies Shakespeare for all your Abrasive Industry Supplies, Ace Stamping & Machine for your High Quality Precision Metal Stampings and Heinrich Co. for Workholding and Metalworking Tools. Shakespeare, Ace Stamping and Heinrich are divisions of Innotec's Parent Company, RC Incorporated. © Innotec of WI, Inc.